The Raiders’ defensive carousel is not the sort seen in shopping malls, theme parks or county fairs. This is no easy ride. ALAMEDA, Calif. — The Raiders’ defensive carousel is not the sort seen in shopping malls, theme parks or county fairs. This is no easy ride. A cornerback can start one week and ride the bench the next. A cornerback can be limited to special teams one game and start the next. A linebacker who is a valued special teamer can be reduced to a healthy scratch while a rookie linebacker can be promoted from the practice squad and make his NFL debut. Around Raiders defenders have gone. Five Raiders players saw more defensive snaps Sunday than they had all season combined. Four players who began the campaign with significant roles on defense saw zero defensive snaps for nonmedical reasons. Those facts require some context, of course. But the mixing and matching and remixing and rematching is part of the story to the defense’s lackluster start. 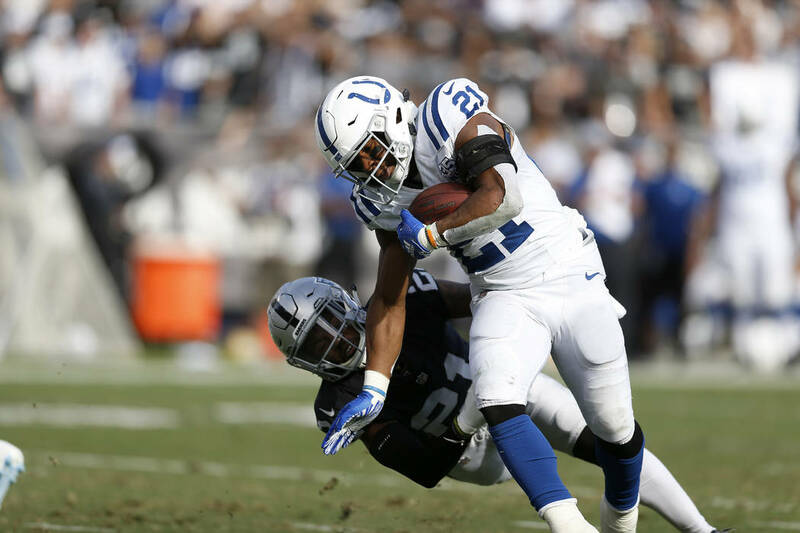 The unit is coming off a 42-28 loss to the Indianapolis Colts in which it allowed four consecutive touchdown drives to start the second half. It managed one quarterback hit, zero sacks and zero takeaways while allowing a third-down conversion on nine of 13 attempts. The Colts totaled 222 yards rushing and 239 passing. This followed an encouraging practice week while coming off a bye. Safety Karl Joseph, a trade candidate by Tuesday’s 1 p.m. deadline, played 31 defensive snaps in his return from a Week 3 hamstring injury. He previously played 11 defensive snaps this season. Rookie cornerback Nick Nelson (21 snaps), linebacker Kyle Wilber (20) and rookie linebacker Jason Cabinda (17) appeared on defense for the first time in 2018. For Nelson and Cabinda, the outing marked their league debuts. Linebacker Nicholas Morrow took 20 defensive snaps. He drew seven in the first six games. Meanwhile, Conley and cornerback Dominique Rodgers-Cromartie flipped roles. In the team’s previous game Oct. 14 against the Seattle Seahawks, Rodgers-Cromartie started opposite Daryl Worley with Conley working only on special teams. On Sunday, Conley played a career-high 76 of a possible 78 defensive snaps. Rodgers-Cromartie worked only on special teams. Cornerback Rashaan Melvin, safety Reggie Nelson and linebacker Emmanuel Lamur were healthy scratches. Riding this carousel can be grueling. “I just think of my son, honestly,” Conley said. “That’s what I’m out here doing it for is my family. My brothers and sisters, my son, my mom. That’s all I can think about because that (stuff) takes a toll on your mind. Of course, the carousel’s impact can be overstated. This is not an elite-level defense undone by its state of flux. There are deep-seeded personnel issues here, the sort that only can be sorted out with draft-pick firepower and financial flexibility. The Raiders have both, but neither can help in 2018. Coaches hope to end this ride soon enough. Constant role tinkering, coaches know, can impact individual player confidence and a group’s on-field communication and chemistry. “It’s hard. It’s hard,” Joseph said. “I’d be lying if I said it’s not because you definitely want to feel comfortable, just knowing, ‘OK, I’m going to be out there.’ In a rotation, it’s hard to get into a groove. At the same time, you’ve just got to execute your job when you get out there.